Palestinian people all over the world, on Monday, marked the 25th anniversary of the massacre which took p;ace inside the Ibrahimi Mosque, in the occupied West Bank city of Hebron, leading to 29 deaths and over 150 injuries, among worshipers. 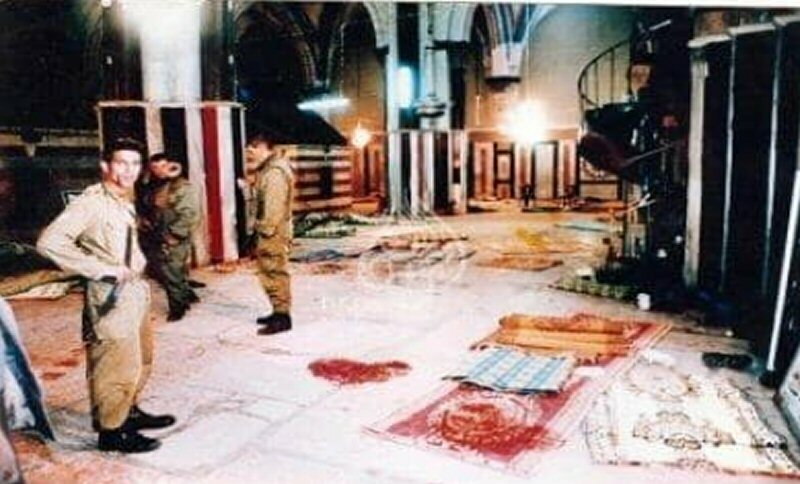 Al Ray Palestinian Media Agency reports that, on February 25, 1994, the 15th of Ramadan, American-born Israeli military settler Baruch Goldstein entered the Ibrahimi Mosque and launched a shooting attack against worshipers who were kneeling in morning prayer. Meanwhile, Israeli soldiers based in the mosque’s area closed the doors of the mosque, to prevent worshipers from fleeing, and also blocked people from entering it to help save the wounded. Other Palestinians were gunned down later, by Israeli forces, outside the mosque and during funerals for the slain, with the death toll, on this day, reaching 50; of them, 29 were killed inside the mosque. Tensions heightened throughout the day, and violent confrontations erupted with Israeli soldiers, in all Palestinian towns and cities, and mainly in Hebron, bringing the total number of the fallen to 60. Following the massacre, Israeli forces closed the mosque and all entrances to Hebron’s Old City for six consecutive months, allegedly for conducting an investigation into the incident. A one-sided committee called “Shamga” was formed by the Israeli occupation, at that time, to investigate the massacre, and led to a number of recommendations. Of these, to be noted is the division of the mosque into two sections; 60% of it for the Israeli settlers, and the remaining 40% for the Palestinians. 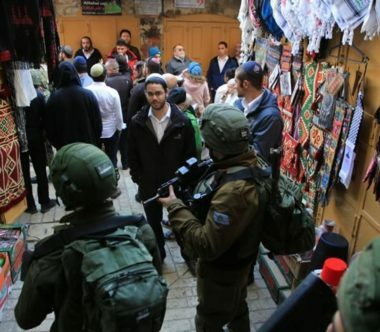 The Israeli occupation also maintained a harsh reality of occupation against the Palestinian people of Hebron’s Old Town district, sealing off a number of markets and roads in the city, and installing security cameras and electronic gates on all entrances to the mosque. Moreover, the Israeli occupation closed all entrances to the mosque, in the face of Muslims, leaving one entrance with very strict military procedures. With these procedures, the Israeli occupation has separated Hebron’s Old Town, in which the Ibrahimi Mosque is located, from its surroundings, with a view to Judaize and seize over them. Baruch Goldstein is a Brooklyn-born Israeli physician. He had emigrated to Israel in 1983, and lived in the illegal Kiryat Arba settlement, based on the Palestinian lands of Hebron. It’s noteworthy that the Ibrahimi Mosque is the fourth holiest site in Islam and the second holiest site in Palestine. It is located to the southeast of Hebron and at the heart of the Old town. 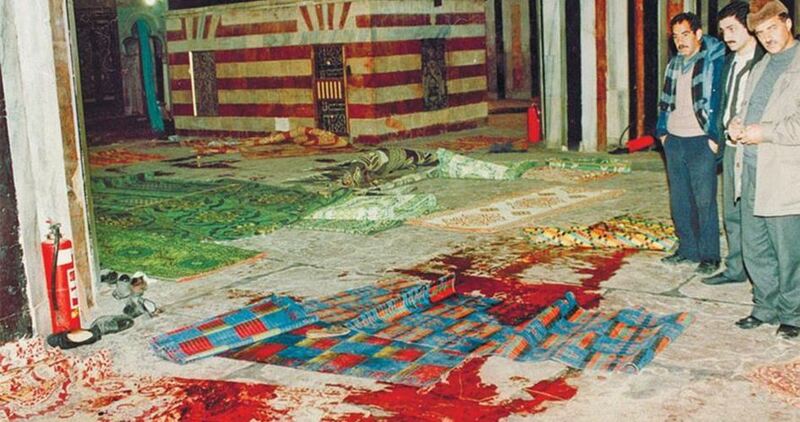 Monday, 25 February, 2019, marks the 25th anniversary of the Ibrahimi Mosque Massacre in the city of Hebron (al-Khalil), perpetrated by Israeli settler Baruch Goldstein, who killed 29 Palestinians and injured some 150 others. On Friday, 25 February 1994, the terrorist Goldstein carried out the massacre when he entered the Ibrahimi Mosque at the time of prayer. He was wearing his military uniform and fired three stores from his machine gun at the Palestinian worshipers performing the Dawn prayer. A number of worshipers survived the massacre and killed him. The Israeli occupation forces closed the gates of the Mosque to prevent worshipers from running away and prevented those coming from outside to reach the area to save the wounded. Later, other Palestinians were killed by Israeli soldiers outside the Mosque and during the funerals of martyrs; the total number of martyrs jumped to 50. Goldstein, 42, a founder of the Kach Movement came to Palestine from the United States in 1980 and lived in the Kiryat Arba settlement in Hebron. He declared before committing his crime that he would commit an act that would “actually stop history,” as he put it at the time. On the day of the massacre, the tension escalated in the city of Hebron and its villages and all Palestinian cities, and as a result of clashes with the occupation soldiers, 60 more Palestinian martyrs were killed. Following the massacre, the occupation forces closed the Ibrahimi Mosque and the Old City for six months at the pretext of investigating the crime. The investigation committee was formed unilaterally by the Israeli Supreme Court Judge Meir Shamgar to investigate the massacre and its causes. At the time, the committee issued several recommendations, including the division of the Ibrahimi Mosque into two sections, and imposed a difficult reality on the lives of citizens in the Old City, and placed heavy security in the region. The committee gave the occupation the right to rule over 60% of the Mosque in order to Judaize and seize it. 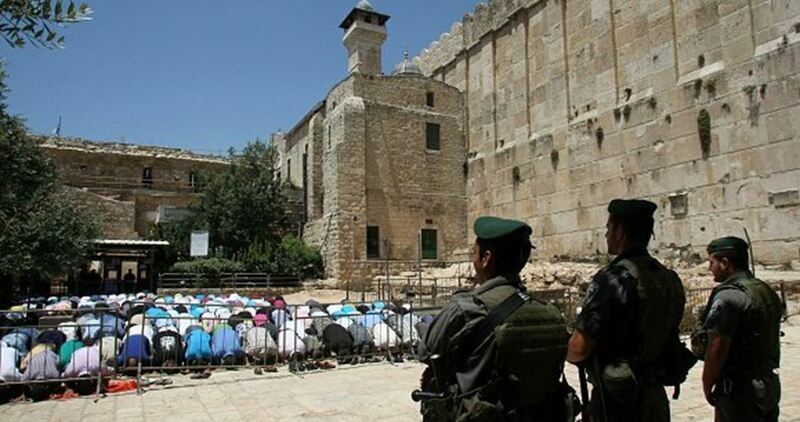 Repeatedly, the occupation prevented raising the call for prayer at the Mosque many times. It also recommended opening the entire mosque for 10 days throughout the year for Muslims only and opening it for 10 more days for Jews only. The Ministry confirmed that it has the jurisdiction and control of the Mosque in terms of religious, administrative and legal issues, which was confirmed by UNESCO’s decision to add the Mosque to the list of the World Heritage, stressing its strong rejection of all Judaization measures taken by the occupation against the Mosque and its surroundings and the Old City of Hebron. The Ministry stressed in the statement that the Ibrahimi Mosque continues to be subjected to serious violations by the occupation forces and settlers. In 2018, the occupation prevented the call for prayer 631 times, and closed it to Muslim worshipers for ten full days. These violations and aggression are of various types, which require us to work seriously to stop them, noted the Ministry. The statement pointed out that what the Mosque was exposed to of division, both in terms of time and place, and the control imposed on it, which is void legally and legitimately as it is a sacred place for Muslims, not only in Palestine, but in the Muslim World as a whole, will not in any way be implemented at Al-Aqsa Mosque. Al-Aqsa Mosque is subjected to an unjust campaign and serious violations related to sovereignty, the last attempt of which was aimed at controlling Al-Rahma Gate. The Ministry said that the people of Palestine in general and the people of the city of Hebron in particular should intensify their presence at the Mosque to protect it. The Ministry called for the resumption of the Palestinian presence there, and the establishment of a program of religious, cultural and social activities that lead to the presence of Muslim worshipers there around the clock, to face Israeli plans with full unity and national consensus regarding general national issues of collective destiny. Dozens of illegal Israeli colonialist settlers carried out, on Saturday evening, a provocative march in the streets and alleys of the Old City of Hebron, in the southern part of the occupied West Bank. Media sources said the colonists marched through the market area, and headed to the street of the City Council then to the Shuhada Street. Israeli soldiers closed the entire area to the Palestinians, and prevented them from entering or leaving it. In related news, the soldiers assaulted Mashhour al-Wahwah, a cameraman working of the Palestinian News & Info Agency (WAFA), while documenting the march. Israeli soldiers attacked, Friday, a nonviolent procession in the center of Hebron city, in the southern part of the occupied West Bank, marking the 25th anniversary of the Ibrahimi Mosque Massacre. Media sources said the soldiers injured one child with the rubber-coated steel bullet, and caused many Palestinians to suffer the effects of teargas inhalation. 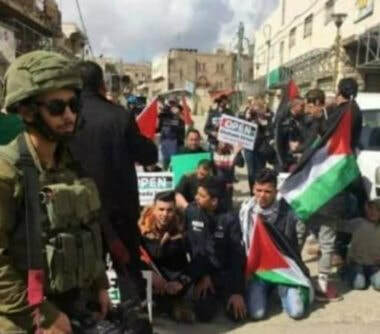 The protesters were also demanding the army to reopen the Shuhada Street, in the Old City, which has been closed since the massacre, and called for a complete Israeli withdrawal from the city. They carried Palestinian flags, and chanted for the liberation of Palestine, in addition to condemning Israel’s illegal expulsion of the international observers of the Temporary International Presence in Hebron (TIPH). On February 25, 1994, an American-Israeli physician identified as Baruch Goldstein, who resided in the ultra-fanatic Keryat Arba settlement in Hebron, walked into the mosque as a large number of Muslim Ramadan worshipers, mainly elderly, were praying and opened fire at random from his Israeli army-issued machine gun leading to the large number of deaths and injuries. To make matters worse, Israeli soldiers, who were in the vicinity of the mosque, closed the doors to the mosque and prevented the worshippers from running for their lives. They also prevented people from outside to enter it to help in evacuating the dead and wounded. Residents who wanted to reach the mosque, and those inside, fought with the soldiers, leaving an additional number dead and injured. Later, related violence raised the number of Palestinians killed on that day to 50, in Hebron alone, and to 60, adding those killed in confrontations that broke out elsewhere in the West Bank, against Israeli occupation forces. Immediately following the massacre, Israel decided to punish the victims by closing down the old town of Hebron, where the Ibrahimi mosque is located, for six months. An all-Israeli committee was formed to probe the massacre, instead of punishing the settlers, to divide the mosque between Muslims and Jews, and to close down several commercial streets, most famously Shuhada Street, which remains closed for Palestinians until today. Army checkpoints were also set up to restrict the movement of Palestinians, while Israeli settlers continued to move freely and without any restrictions. The impact of the Ibrahimi Mosque Massacre in Hebron was not limited to blood, martyrs and wounded; but rather, since day one of the massacre, the place has been transformed into a tight Israeli security complex, in which all kinds of oppression are practiced against the Palestinians. On the 15th of Ramadan in 1414 AH, the criminal Jewish terrorist Baruch Goldstein committed a massacre against Muslim worshipers in the courtyards of the Ibrahimi Mosque in Hebron during the dawn prayers, killing 29 worshipers and injuring 150 others. Israeli security measures could be seen at the site of the massacre, hundreds of cameras, electronic gates, high towers and heavy machine guns, all supported by hundreds of heavily armed soldiers. The above-mentioned Israeli restrictions are the consequence of the unjust and painful Shamgar Commission, which was set up by the Israeli occupation authorities to investigate the horrific massacre. The mosque is divided from inside, and the entrances into it are encircled by electronic gates. At first glance, crossing the mosque feels like crossing into a security headquarters or an army camp, as the director of the Ibrahimi Mosque, Hifzi Abu Asnina, told the PIC reporter. Settlements experts point out that the policies of the occupation which includes besieging the Ibrahimi Mosque, and the imposition of strict security restrictions on the worshipers while entering and leaving the place, and its division, and allowing settlers in large numbers, and giving them large space, is a warning message to the people of Hebron in general and the people of the Old City in particular. Abd al-Hadi Hantash, a settlements expert in Hebron, said that the gravest consequences of the massacre of the Ibrahimi Mosque was the new security measures that turned the place upside down, and the religious hegemony over the mosque, which enabled Jewish settlers to dominate the area around the mosque and its courtyards. “The settlers controlled many facilities surrounding the mosque after the massacre, and many sites and buildings, such as the Osama bin al-Muknaz school, the vegetable market, the entire Awqaf district, the Kaffasin market, the Sahla market, the Al-Kayyal mosque, Al-Aqtab mosque and the old Takiyya. These sites were turned into military sites and barracks, some of them became housing units for settlers. Entry and exit of the Ibrahimi Mosque required the approval of Israeli security and could only be done under the supervision of hundreds of cameras and electronic gates. According to Haj Hashem Abdul Nabi Natsheh, former head of the Hebron Chamber of Commerce, the post-massacre measures in the city destroyed its economy, and the settlement and security presence led to the closure of hundreds of shops and many markets, resulting in hundreds of millions of dollars in financial losses. He noted in a statement to the PIC that “The aim of all this was to empty the town of its inhabitants and turn it into a ghost town that the Israeli army and its settlers could roam freely. All markets in the Old City were closed, which included more than 1,300 shops, under the pretext of security and protection of settlers, he said, adding that one of the most dangerous and devastating consequences of the massacre of the Ibrahimi Mosque 24 years ago was besieging the Old City of Hebron and the economic destruction of the city, in addition to the division of the Ibrahimi Mosque.